RugbyPass.com is a subscription rugby union streaming website. It streams live games and also has a substantial catalog of past games available to watch. - so normally would not work in New Zealand or Australia. You will need a VPN / Smart DNS to sign-up on their website. If you don't use a VPN, you may only be given the limited $0.99 p/m option (which won't work). 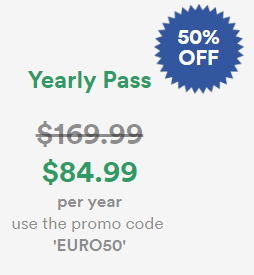 You will need one which provides an exit node (country) that is supported by Rugbypass. eg. Singapore or Hong Kong. For a Free VPN I recommend Windscribe (aff link). Note: Free plan has limited bandwidth - use for signing up and then use my KODI Add-on below. For a Paid VPN I recommend Private Internet Access (aff link). For a Smart DNS I recommend Smart DNS Proxy (aff link). Please let me know if you find any other codes and I will add these in. 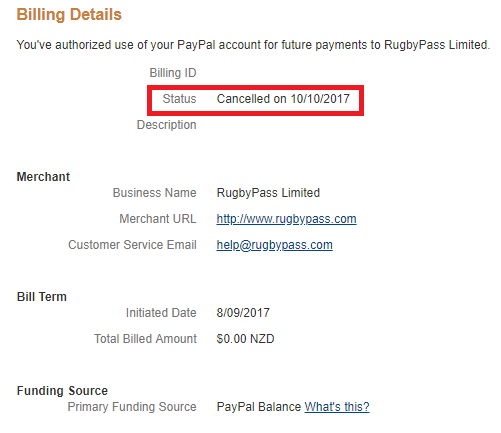 I recommend paying with Paypal as this let's you cancel your subscription anytime by removing the Pre-approved Payment. 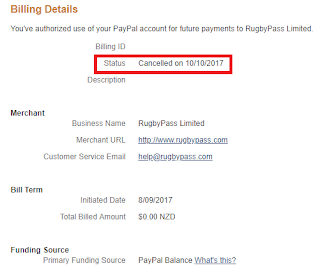 Click on "RugbyPass Limited" and then click "Cancel" next to status. This will remove their ability to automatically renew your subscription. - you may be surprised who has permission to charge you $$$. If you want to use their RugbyPass app or website to watch games, you will need to use the VPN or Smart DNS service. Alternatively, you can use my below KODI add-on that doesn't require either. My KODI add-on doesn't require a VPN or Smart DNS. See the instructions for installing it HERE.